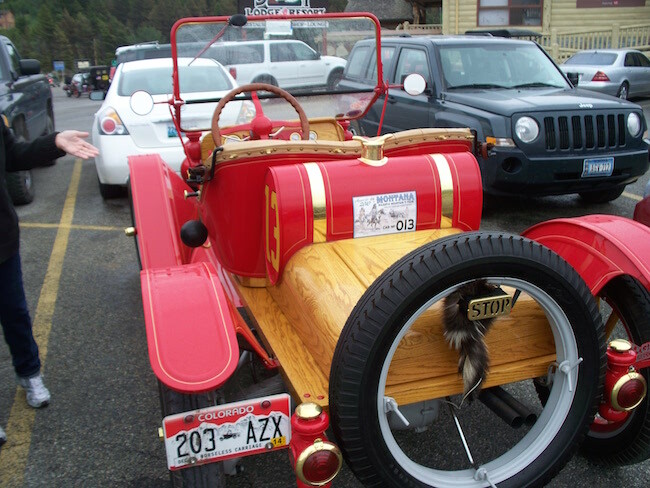 What is your intended purpose for the Model T? Show, local driving, park in the garage, drive in tours? Don't forget when you start increasing your braking ability that tire traction will quickly become your limiting issue. Birdhaven in Iowa will be selling the hydraulic disc brakes formerly sold by Texas T's and developed by Bill Tharp. I purchased mine from Bill and have had them for 6 or 7 years now. Trouble free, installation was easy, and you can convert back to original at any time. Your transmission brake still works, but you back it off a little so the hydraulics work first. Parking brake still works. Lots of opinions here on the forum, but you won't find anything that works better, for rear only brakes. The purpose of such an upgrade I though was self explanatory. Stock brakes on a T offer little stopping ability. Not to sound rude why would one upgrade brakes just to sit in a garage?? Just looking to hear ideas of what others have tried or done with success or failure. I'm sorry, Jason, I didn't know that my question would offend you- that was not my intent- I'm not that kind of guy. In my opinion- for a car that does not tour or a car that tours mainly flat land in dry weather Rockies work well. If you tour hills, mountains, or in wet weather I like the Sure-Stop disc brakes that Birdhaven is now selling. They work great under all conditions. I have both types and like them both. Most anything beats Ford brakes. Some folks may have a different opinion. 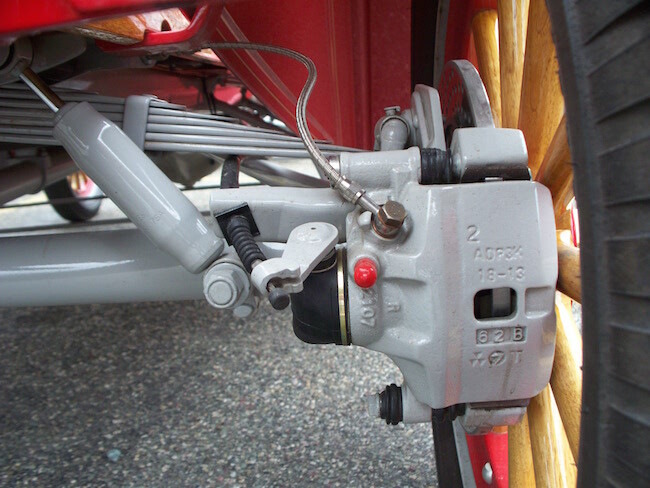 I cannot find it but someone here posted photo's of a hydraulic drum brake set-up from a foreign car on his rear wheels. (possibly a Speedster). Very impressive and almost invisible. I think he used the drums from the donor car. All was painted yellow. Wire wheels. You still had to look close not to realise the drum wasn't a stock T. Believe the hand brake operated normally too. This is the prettiest Speedster I have ever seen. Every detail is meticulous . Photo taken in August 2010 on Glacier NP tour. 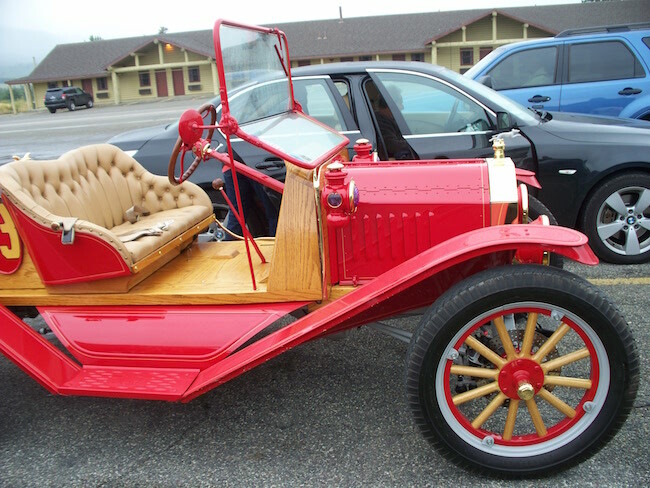 Note the parking brake on the rear calipers. 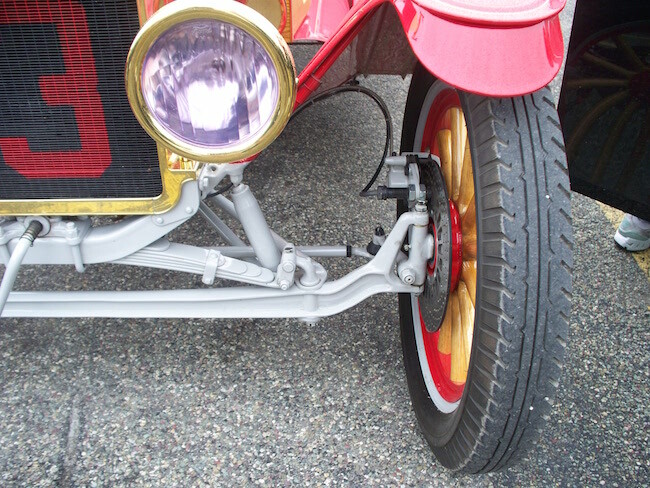 That's neat how the builder of the red car added an extra wishbone to the top side of the axle.